Notting Hill Carnival, Europe’s largest street party, erupted into a full blaze of color for a second day with hundreds of thousands lining the streets of London to watch the show yesterday. Performers wearing a vivid array of stunning costumes paraded through the streets under glorious Bank Holiday sunshine. Hundreds of thousands of people descended on the west London streets as they are turned into a Caribbean party of dance, music, floats and food. The total number of visitors to the two day festival is estimated to reach one million by the end of the day. Yesterday, known as family day, saw both young and old dancing to giant sound-systems set up on street corners, while procession performers wore multi-colored costumes, played steel drums and danced behind trucks which pumped out anything from reggae to dancehall, and calypso to dub. Scotland Yard said police made 93 arrests – mainly for drugs offences – while London Ambulance Service and St John Ambulance treated more than 300 people for cuts and bruises to their feet and alcohol-related injuries. A spokesman said 45 were taken to hospital. Other arrests were made for assaults on police, public order offences and possession of offensive weapons, Scotland Yard said. Not to be left out of the fun, London’s police also got in on the celebration – by performing an impromptu dance off. Dressed in full uniform, stab vests, florescent jackets and battons, the officers broke out their finest moves to impress the crowd. The comic moment was caught on video by one of the hundreds of revellers who had cleared a circle too see if the policemen could outshine the carnival performers. The carnival has been held in London’s Notting Hill since the 1960s and has since spread to other locations, such as Kingston and Leeds. It was first organized by West London’s prominent Afro-Caribbean community and will celebrate its 50th anniversary on August Bank Holiday 2016. 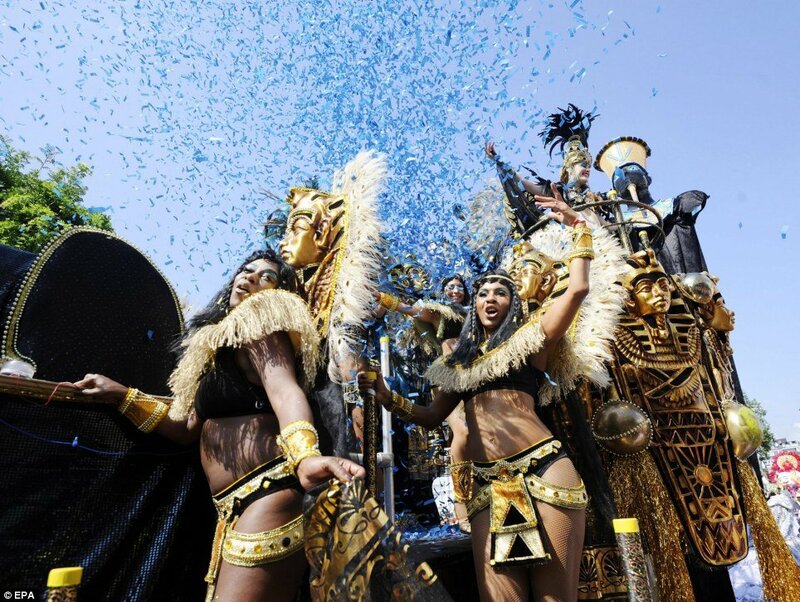 Notting Hill Carnival is the largest street festival in Europe and over one million people has been expected to take part in the festivities this year.